Eliminations for multi-currency consolidations are useful for two different functions: to eliminate inter-company accounts, and to perform elimination adjustments to balance the balance sheet. 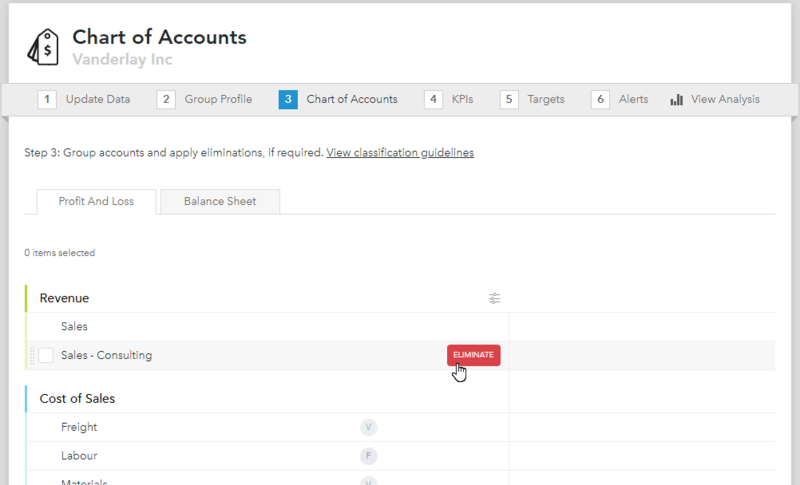 Within the setup for a consolidated group, you can go to 'Chart of accounts' and perform quick elimination of inter-company accounts that typically contra each other out. This will help provide a more accurate view of consolidated performance. Beyond the eliminations step, additional elimination adjustments are often required to balance the balance sheet, since movements in exchange rates (used to translate the accounts) can cause the inter-company accounts to no longer contra each other out. To include these adjustments, you can import an excel spreadsheet that details specific adjustments, and is applied only to the consolidated financials. To add elimination adjustments, go to "Add a company", then select "Excel" as the source, then import a spreadsheet, it will appear as another "company" in Fathom. We refer to this as "Eliminations Co". The financials of this entity should include only the journal adjustments that you wish to make to the consolidated group. The import spreadsheet MUST include the word "eliminations" in its name (Cell B1). Next, you will add this "company" to your consolidated group. Click on "Manage group" in 'Step 1' of the setup for the group. This adjustments “entity” will not be shown as part of the performance of the group in analysis and reports; the adjustments will only be reflected in the eliminations column of your consolidated financial statements. For instance, when viewing the Excel report called "Multi-currency consolidated financial results, including eliminations ", you will see data for "Eliminations Co." shown in the Eliminations column only. Detailed instructions for eliminations and eliminations adjustments can be found here: Guide to Consolidations in Fathom (see pages 25-28).